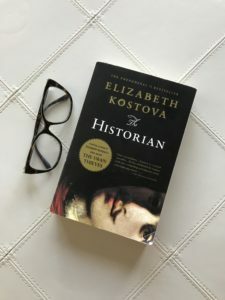 The Historian, by Elizabeth Kostova, is a sweeping historical fiction about, well, historians. This epistolary novel takes you on an adventure spanning centuries, hunting for the truth behind the myth of Dracula. If that isn’t enough for you, there’s romance, mystery, and suspense on every page. Click here for the entire review. Share the post "Now We’ve Got Vlad Blood"
I have owned this book for so long. I have a first edition. It has never been touched. I really should get to it! I fell asleep in front of a general because of this book 14 years ago! We were supposed to meet him (I was a cadet on a special summer training) and I spent the whole night before reading this because I couldn’t put it down, and only got about two hours of sleep and didn’t even quite finish it. Let’s just say, sitting at a conference table did not work out for me, regardless of how much the man at the head of the table outranked me. oh man, I remember being absorbed by this book when I read it (in 2006?) but something kept me from rating it more than three when I joined Goodreads. I can’t quite recall either but I feel like it lost steam in the ending. Like after all this crazy build up, where all you wanted were answers, it kind of just faded off. I accidentally deleted the first draft of my review and had to rewrite it, but originally I mentioned exactly that. Around page 500 it just starts to slog, and you’re like “Okay I get it. Get to the point already!” I sort of skimmed about 20 pages, and then it picked back up, and had a satisfying ending.